Bafana Bafana jumped to the top of Group E after thrashing Seychelles 6-0 in their African Cup of Nations qualifier on Saturday, writes DYLAN APPOLIS. The victory took Bafana Bafana to the top of the group standings with seven points, while the Pirates remained at the foot of the table and are yet to claim their first point in Group E.
The South African national team were looking to return winning ways after playing to a goalless draw against Libya in their previous qualifier last month. Meanwhile, Seychelles were hoping to end their winless run in the group after falling to a 3-0 defeat at the hands of Nigeria in their previous fixture. The home side got off to a good start on the wet field of the FNB Stadium. Aubrey Modiba had a chance to hand Bafana the lead after six minutes, but the attacker guided his header over the bar after receiving a cross from Ramahlwe Mphahlele. South Africa should have taken the lead in the 14th minute, but Percy Tau saw his free kick rattle the woodwork. However, Bafana’s persistence paid off nine minutes later when Nigel Hoareau headed the ball into his own net as he attempted to clear the ball to safety. Thulani Hlatshwayo doubled his side’s lead two minutes later when he received a cross from Modiba before finding the net, 2-0. Lebohang Mothiba made it 3-0 in the 27th minute after he curled his strike into the top corner of the net. Bafana managed to take their comfortable lead over Seychelles into the half-time interval. The home side picked up where they left off in the first half and looked in good spirits as the second half began. In the 51st minute, Tau rattled the woodwork with his thunderous effort, but the forward was flagged offside although the replay showed that he was onside. Barra came to his side’s rescue in the 70th minute when he produced a fine save to deny Modiba. 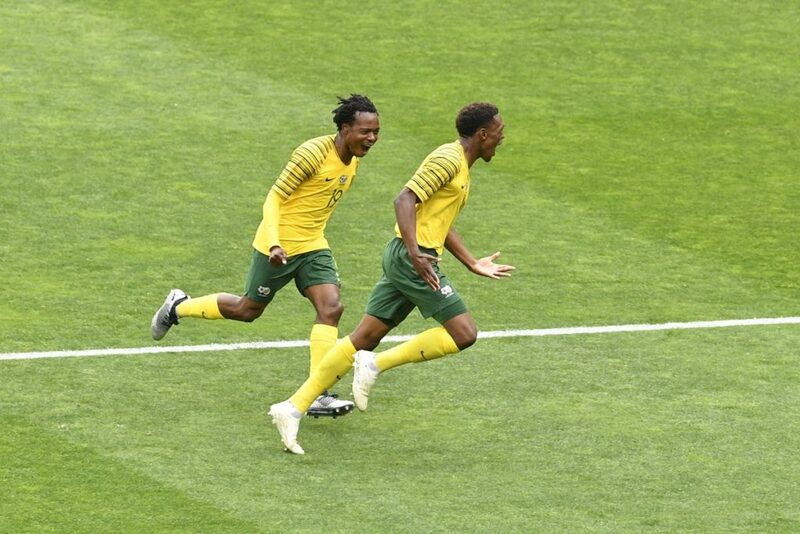 Bafana looked in full control of the game and made it 4-0 four minutes later when Mothiba cleverly flicked the ball into the path of Tau, who chased it down before rounding the Seychelles goalkeeper to put his name on the scoresheet. With 10 minutes left to play, substitute Dino Ndlovu opened his account for Bafana when he latched on to a perfectly weighted pass from Maboe before putting the ball beyond Barra. Shortly after coming on for Dean Furman, Teboho Mokoena rounded off the scoring for the hosts with the last kick of the game to collect maximum points at the FNB Stadium. Bafana Bafana: Khune, Mphahlele, Hlanti, Mkhwanazi, Hlatshwayo, Modiba, Furman, Maboe, Mokotjo, Tau, Mothiba. Subs: Williams, Phiri, Ndlovu, Kekana, Mokoena,Maela, Xulu. Seychelles: Barra, Nancy, Nigel, Joubert, Marie, Bibi, Damoo, Monnaie, C. Esther, B. Esther, Hopprich. Subs: Lesperance, Waye-Hive, Laurence, Sinon, Lawrence.